It seems trite to blog such a political, career-altering event. But I must. It has galvanized a social network to launch a blitz-post akin to an online flash mob. Everybody is going to write about this. Everyone is talking about this – as well they should. A man responsible for claiming the lives of thousands is dead. Hurray? Hurry? or Hero? Yeah. That’s the word I’m hoping will emerge: Hero. Within the confines of my colorful world, I sat with my sister Natalie watching “Celebrity Apprentice” while we munched on expensive peanut brittle from Williams-Sonoma. It was God-good. We marveled at the rich, buttery flavor and traded crunches and smacks from my reclined seat on the chaise to her body sprawled and sofa-lateral. The reality show spectacle of NeNe Leakes versus Star Jones “I will cut chu” fame was nearing another predictable end and my sister gave notice to the informative “crawl” creeping across the flat screen. 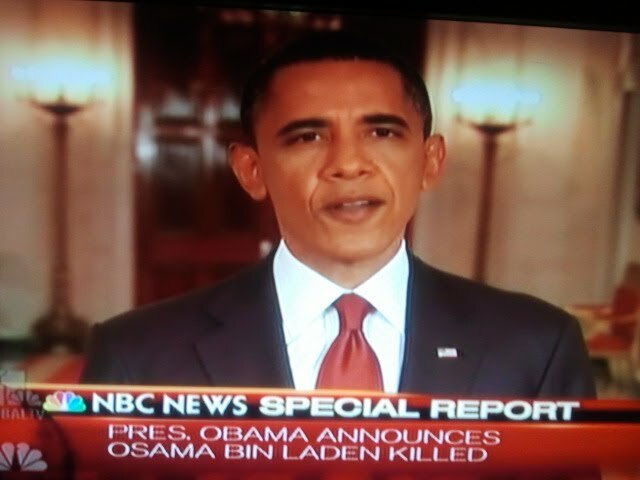 President Obama will soon make an important message regarding Osama Bin Laden. He’s dead or we killed him? I was really hoping he didn’t kill over- from kidney failure. What a waste of time that would have been for our military troops. It felt a bit macabe to wish we killed him, and by “we” I mean our gear-clad, dusty and armed troops who have forsaken holidays and their own family nights to fight for justice and to fight for just us. The Donald is in the Celebrity Apprentice Board Room. His golden hair is glistening and molded in its iconic, stiff wave and he’s network-ready to assert his coined phrase, “You’re Fired.” Me and my former Air Force Recruiter sister are impatiently waiting for both The Donald and President Obama. Correspondents are pumping the prelude and The Donald is in ratings control. The reality consumed world is also watching and waiting: Will it be Star or NeNe? Will a fight ensue and weave tracks become airborne? Will Marlee Matlin’s translator break his fragile wrists trying to keep up or will……………cut to the fade of a presidential black. Here comes Soul Brother President Swaggaligious walking in glorified authority to his Oval Office podium. The Donald has been silenced. The world is edge of seat. The news is big. It’s breaking news that has been previously leaked. The words are strong and piercing and sharp and clear: Osama Bin Laden was basically taken down by an intelligent intelligence and beat at his own game of hide and go die. Like buttons were clicked and lit. Comments were dropped and threads began to grow long as self-appointed, peanut gallery pundits offered their view of what has happened and their fear of what’s to come. Footage of flag waving took over the big screen. Crowds emerged upon the White House Lawn. Osama Bin Laden’s death < Michael Jackson’s death. The world as we Monday-morning know it will forever change and two, newly married Royals have been given an unexpected gift called publicity diversion. Next week will not be like next week and no week will ever again be like this coming week. Momentum is about to have her moment and she will likely birth a bevy of hours and days and months of both fervor and fodder. We like President Obama’s measured words, his no nonsense tone, his direct “camera-eye focus” and his sincerity to save and preserve the safety and lives of American citizens, our friends and allies. I loved that latter line. Don’t mess with my people or my friends because “I will cut chu” or in this case: kill you. Yes, we know Daddy Bush [and then his son Dubyah] vowed to get Osama Bin Laden. He didn’t. Yes, we know measures were in place to find him, kill him, and bring his body dead or alive. They didn’t. No one black will read that post and think that. It’s not a black thing, it’s not a white thing, it’s really not even a presidential thing. It’s a good thing. A humanitarian thing. A finite justice. A deserving end to a tragic era preparing to commemorate a 2011 anniversary. It’s over and it’s just beginning. I am 1000 miles away from my Florida home and scheduled to fly from BWI to JAX tomorrow evening. I feel compelled to find time to embrace D.C. tomorrow afternoon with camera in tow to capture history as it unfolds in the streets, on headlines, on the Metro, and of course, in Starbucks lines. I feel compelled to call Southwest and ask if I can reschedule my flight so that I can stay with my sister until there’s not a crumb of peanut brittle left in the wide of the can. Do I really just want to stay with my sister or do I just want to avoid being 30,000 feet-high in revenge-air? I certainly wasn’t thinking any of this 24 hours ago, but now me and the rest of the world will have to pause and ponder our every movement. Once again America is on terrorist alert. I pray his demise doesn’t kill my freedom. Penny, incredible. Just as I will never forget elements of 9/11, I will remember today and I will remember your words. Prayers for safe travels. I have conflicting opinions and feelings. . . This was a great read. I usually watch CA but I wasn’t watching that night. Obama Trumps Trump indeed. You also awakened a serious craving for peanut brittle. Always great to read your thoughts.